Confession here – I am a hoarder. A hoarder of chicken carcasses. Until today only my husband knew this about me, the poor man has to dig through bags of frozen chicken bones to get to the ice cream in our freezer. Thing is, I think you should start hoarding them too. Left over chicken bones, scraps of onion peel, sad dried out carrots from your veggie drawer – they can all be turned into pure gold. Homemade chicken stock is 100% better than anything you can buy in the store and the best part is it’s practically free. The only real investment is time but it’s totally worth it. 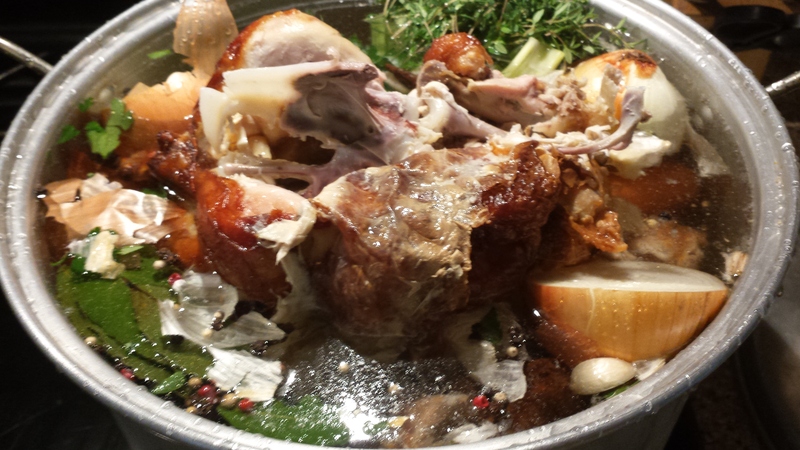 Anytime you roast a chicken or grab a rotisserie from the store, save any parts you don’t eat. 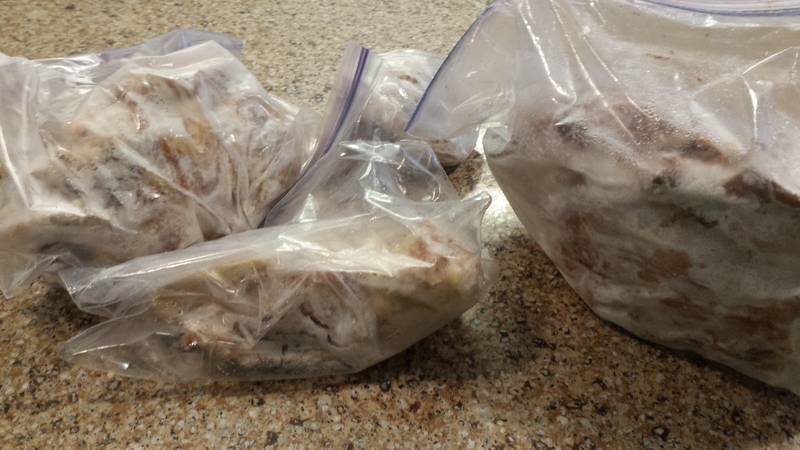 It goes without saying save the bones but also keep any extra meat you don’t eat, the skin – basically everything should all go into a plastic freezer bag. When you have carrots or celery that are looking a little less than pristine, throw them into a bag as well (throw them in with the chicken if you want). Once you have critical mass, approximately 4 chicken carcasses, or when you can no longer navigate around them in the freezer, then its time to carve about 4 hours out of a weekend to babysit a pot of stock. You throw everything into a pot, cover with water and soon enough your entire home will smell absolutely amazing. Some recipes for homemade stock call for whole uncooked chickens but that just seems like a waste to me. Tons of flavor comes from the bones and the leftover ones have the benefit of already having been roasted, which gives the stock a deeper flavor. 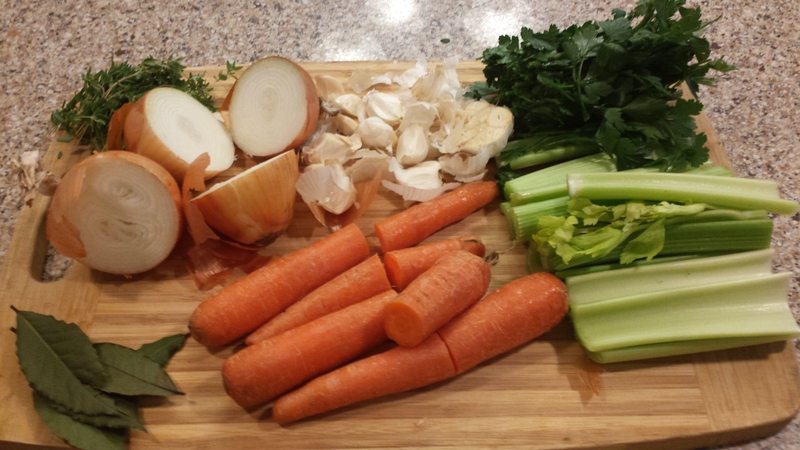 I use a pretty basic mix of celery, carrots, and onions but you can throw in other left over veggies as well. Just be careful because whatever you put in, that flavor will be imparted. Sometimes if I have fennel hanging around I toss that in and my stock will have a slight anise hint to it. I wouldn’t use anything too strong like a broccoli or anything too soft like a zucchini. You can also use different herbs, dill is really nice, as is marjoram but I would steer clear of rosemary as it’s a bit too strong. Once you have the stock the sky is the limit on how to use it – obviously as a base for soups and stews but I also like to use it to deglaze my pan when cooking, to cook rice or couscous in, or to braise meat or veggies. It will last in the freezer for a long time, about 8 months but I guarantee you will use it up well before that. I do keep boxed chicken stock on hand just in case but it is a total bummer when I realize I don’t have any homemade stuff left and have to resort to the box – the flavor, richness and viscosity is totally different and inferior in my humble opinion. With fall on its way its time for yummy, comfort food and this chicken stock is the best place to start. Get the largest pot you have, I use my grandmother’s old lobster pot, and throw everything but the water into the pot. It will probably be an awkward fit especially if the chicken carcasses are frozen but once the water is in and it starts to get heated up, everything sort of slumps together so don’t worry. Fill the pot with water, just to the brim, so you can actually carry it over to the stove (this is why my dream kitchen has a pot filler). Set over medium high heat uncovered and wait for it to boil – depending on how big your pot is and how much water you have in there it can take up to 45 minutes. Yes it looks like a mess but trust me. Once it has come to a boil turn the heat down so that the liquid is simmering – you don’t want a lively boil, just a handful of small bubbles reaching the surface. Sometimes you will get a foam on top like in the picture below, I just skim that off and toss into the sink. Cook like this for 3-4 hours checking on it occasionally to make sure it’s still simmering. Sometimes you might need to adjust the heat up or down during those hours as the simmer can fall flat or it can be going too hot. I stir it a couple of times as well just to move everything around but it doesn’t need much babysitting. After 3-4 hours the liquid will be nice and golden. 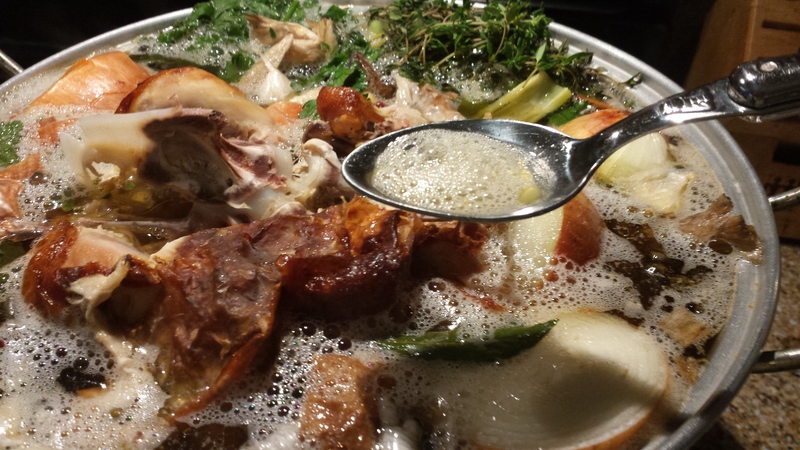 I then use a strainer scoop to pull out the big chunks of chicken and vegetables and toss them. When it’s mostly liquid pour through a fine strainer or line a regular strainer with cheese cloth. My last batch produced 4 quarts and 4 pints but really its hard to gauge exactly what the result will be. After the liquid has cooled put it in the fridge and you can keep it there for several days or transfer it to the freezer for the better part of a year. Depending on how much skin and fat were on your chicken carcasses, there may be a solid layer of fat that settles on the top once it’s cooled. That makes it pretty easy (though gross) to scoop it off the top. Also once chilled the stock will take on a sort of gelatinous consistency and that is a good thing. The gelatin in the chicken bones is what causes that – once its been heated again it will go back to its liquid form but it’s a good way to tell the truly homemade stuff versus the thin boxed stuff. Get the largest pot you have and throw everything but the water into the pot. Fill the pot with water, just to the brim so you can actually carry it over to the stove. Set over medium high heat uncovered and wait for it to boil – depending on how big your pot is and how much water you have in there it can take up to 45 minutes. Once it has come to a boil turn the heat down so that the liquid is simmering – you don’t want a lively boil, just a handful of small bubbles reaching the surface. Sometimes you will get a foam on top, I just skim that off and toss into the sink. Cook like this for 3-4 hours checking on it occasionally to make sure it’s still simmering. Sometimes you might need to adjust the heat up or down during those hours as the simmer can fall flat or it can be going too hot. I stir it a couple of times as well just to move everything around but it doesn’t need much babysitting. After 3-4 hours the liquid will be nice and golden. I then use a strainer scoop to pull out the big chunks and toss them. When it’s mostly liquid pour through a fine strainer or line a regular strainer with cheese cloth. 5. Turn crock on for as many hours as you have available. 6. Retrieve chicken and shred the meat, use for tacos, chili, whatever. 7. Season broth a bit more, pour into container, freeze.